REGINA BEACH, Sask. - The owner of a Saskatchewan home that was levelled in an explosion says a hand-sewn quilt was among the sentimental items engulfed in flames. 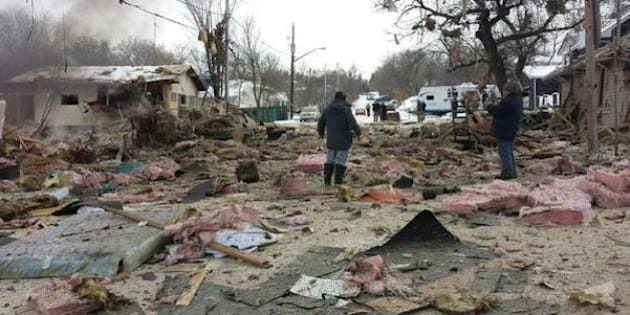 "It took 15 years," said Cathy Oldershaw, whose Regina Beach cottage was at the epicentre of a massive blast on Wednesday. "I just finished a couple of months ago." She added that her family is relieved no one was injured. Oldershaw, 62, and her husband have their permanent residence in Regina, about 50 kilometres to the south. She said the couple had planned to be at the cottage in Regina Beach on Wednesday, but she had to work. "We could have been here," she said. RCMP spokeswoman Mandy Maier said up to 12 other homes within 800 metres of the blast were damaged in the small resort community north of Regina. Pictures on social media showed building materials and household items littering a street in Regina Beach and debris hanging from trees and power lines. The destroyed home had been standing next to a post office, where the blast knocked a large hole through an outside wall. Dave Burdeniuk with SaskEnergy said it appears shifting ground caused a natural gas leak in a line adjacent to the house property. Gas was shut off to several homes and businesses in the area while workers tested for other leaks and dug up the line for repairs. He said it was hoped the work could be finished sometime Wednesday night. "We want to obviously get gas restored to any of the homes or businesses that have had gas shut off because it is a cold night." RCMP had asked people to stay away from the area. Ron Nakonechny, 50, said the community is visibly shaken by the explosion. "I thought a tree had hit the top of my house," he said, adding that his home is only a few houses away from Oldershaw's property. "That was the force of the blast that I felt. The impact, knocking things off the wall. "Then I saw the smoke and the flames." He added that the blast was comparable to an explosion and fire at Federated Co-Operatives Ltd.'s refinery in Regina last Christmas Eve. He was working at the refinery at the time, he said. "That initial shock ... you're never used to it," he said. "If it was your own house, I think panic and that's it because you're more concerned about the people. "Property can be replaced and repaired, people can't," he said. Regina Beach is about 50 kilometres north of Regina on the shores of Last Mountain Lake. It's home to about 1,000 people and is a popular recreation destination during the summer. The RCMP continues to investigate.